Few nations rely upon the ocean as much as Japan for livelihood, culture and transport. The seas have long played a vital role for the Japanese, helping to support the economic and social life of a nation that possesses few resources and little arable land, and sustain a population that has nearly tripled in the last century. Fish are a distinctive feature of the Japanese diet, constituting nearly half of all animal protein consumed – the highest rate in the world. The industry itself has provided an impetus for coastal community growth and national economic development over the past century, while fisheries have worked their way into Japanese culture and customs, serving as a dominant symbol in traditional arts and folklore. This book explores the overarching rationale that motivated Japanese international fisheries policy throughout the post-war period until today, highlighting the importance of international fisheries to Japan and the stature this resource has occupied as a national interest. It provides a comparative view of Japanese foreign policy at various ocean conferences, treaty negotiations, bilateral diplomatic initiatives and other maritime relations that constitute ocean policy over half a century, and investigates the domestic constituents of national policy. 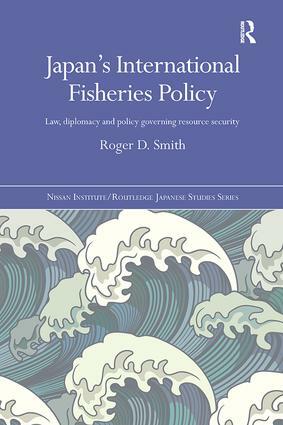 Roger Smith argues that the rationale for international fisheries policy may be best viewed as deriving from Japan’s unique defence strategy for its national interests: comprehensive security. Encompassing non-military elements and most importantly defence of economic interests, Japan’s international fisheries policy provides an interesting case study of how comprehensive security is conceptualised and carried out. Taking a broad view of Japan’s international fisheries policies from 1945 to the present, this book highlights the key trends in policy motives and means throughout the post-war period. As such, it will be of great interest to students and scholars of Japanese studies, international and environmental law, resource management and international relations, as well as to policy makers working in the field.